Add TET3 polyclonal antibody - Pioneer to my shopping cart. Request a quote for a bulk order for TET3 polyclonal antibody - Pioneer. Please fill out the form here below. Your local sales account manager will get in touch with you shortly and send you a quotation based on your requirements. Polyclonal antibody raised in rabbit against TET3 (Tet Methylcytosine Dioxygenase 3), using 4 KLH-conjugated synthetic peptides containing sequences from different parts of the protein. 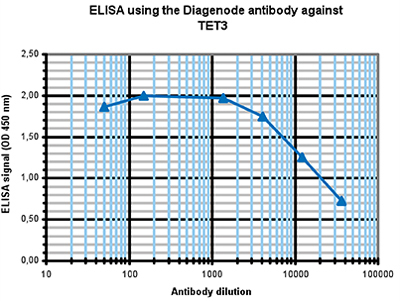 To determine the titer of the antibody, an ELISA was performed using a serial dilution of Diagenode antibody directed against mouse TET3 (cat. No. C15410311). The plates were coated with the peptides used for immunization of the rabbit. By plotting the absorbance against the antibody dilution (Figure 2), the titer of the antibody was estimated to be 1:20,300. Whole cell extracts (25 μg) from Jurkat cells were analysed by Western blot using the Diagenode antibody against TET3 (cat. No. C15410311) diluted 1:1,000 in TBS-Tween containing 5% skimmed milk. The position of the protein of interest is indicated on the right; the marker (in kDa) is shown on the left. Whole cell extracts (25 μg) from Jurkat cells were analysed by Western blot using the Diagenode antibody against TET3 (cat. No. C15410311) diluted 1:200 in TBS- Tween containing 5% skimmed milk. Lane 2 shows the results after incubation of the antibody with the immunizing peptides. The position of the protein of interest is indicated on the right; the marker (in kDa) is shown on the left. TET3 (UniProtKB/Swiss-Prot entry O43151) is a member of the ten-eleven translocation (TET) gene family which play a role in the DNA methylation process. It catalyzes the conversion of the modified genomic base 5-methylcytosine (5mC) into 5-hydroxymethylcytosine (5hmC) which is the first step in demethylation of the DNA. TET3 may therefore play an important role in gene activation and plays a key role in epigenetic chromatin reprogramming in the zygote following fertilization. Diseases associated with TET3 include acute myeloid leukemia. Diagenode strongly recommends using this:	TET3 polyclonal antibody - Pioneer (Diagenode Cat# C15410311 Lot# A2307P). Click here to copy to clipboard. Add TET2 polyclonal antibody - Classic to my shopping cart. Add 5-methylcytosine (5-mC) monoclonal antibody 33D3 - Premium to my shopping cart. Add 5-hydroxymethylcytosine (5-hmC) monoclonal antibody (rat) - Classic to my shopping cart. Add 5-hydroxymethylcytosine (5-hmC) monoclonal antibody (mouse) - Classic to my shopping cart. Add 5-hydroxymethylcytosine (5-hmC) polyclonal antibody (rabbit) - Classic to my shopping cart. Add 5-Carboxylcytosine (5-caC) polyclonal antibody - Classic to my shopping cart.